During regular hours, please contact your veterinarian. 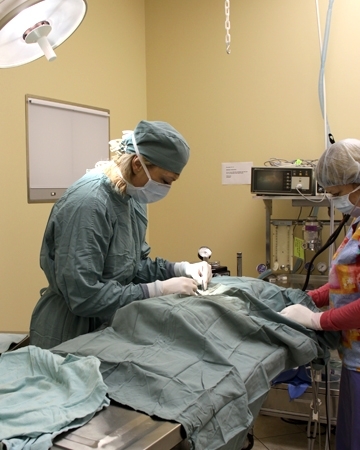 If you pet needs veterinary care, take action. If unsure, and your regular veterinarian is closed, then call the Emergency Veterinary Clinic for advice at 905-495-9907. 2. Protect your pet from further injury. Gently wrap your pet in a blanket, pets may bite or scratch when in pain. 3. Direct pressure may be applied to any bleeding area. 4. If poisoning is suspected, bring the product and packaging with you. Call the Brampton Vet Clinic/Animal Hospital first as advice such as induce vomiting may be required. 5. If back injury is suspected, move your pet very carefully. Place on a flat surface and minimize movement. 6. Immediately come to the Emergency Veterinary Clinic. Located at the corner of Hwy 10 and Wexford Drive in Brampton. Make sure all family members and care-givers have our contact information and directions to the Emergency Veterinary Clinic. For directions, please visit our Contact Us page.